I have not been around much as I have been busy organising things at home. With Christmas not far off I like to get the house organised and do some deep cleaning before winter sets in. Preserves have been made and are now ready to be packaged up as gifts. Knitted items are ready to be given to various charities or posted off to friends. The Patchwork Knitted Blanket is coming along nicely and I will soon have a new panel to sew into place. I have been making a few other items in between as I needed to make a few gifts so I am working on these before I continue with the blanket. I seem to have a lot of odds and ends of yarn that are not long enough to make something with so I have rolled these up together to create a large ball of yarn. Rather than knot the yarns together I simply carried on adding yarn to the ball so when I knit the yarn I will be able to add the new colour anywhere in the row. It will create a random effect and hopefully look interesting. I want to make a few scarves with this ball of odds and ends for the Salvation Army they do a lot of work with the Homeless and those less well off who need a helping hand. I have a couple of easy patterns that would lend themselves nicely to my scrap ball of yarn so I will experiment and see what happens. First of all I need to make some Fingerless Gloves that I have been wanting to make. 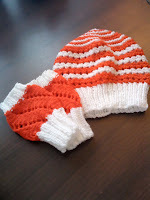 This is what I made for a friend using up some red and white yarn from my stash. A super easy scarf that knits up on the diagonal. I added a crochet border to the ends rather than tassels as I thought it would look nice. I will add the pattern to this in another posting. 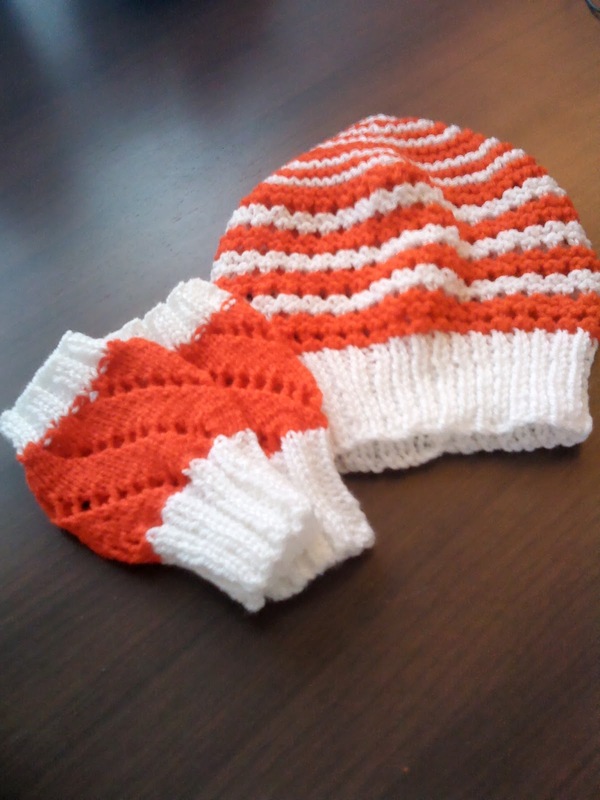 I added these to the gift to make it a set of red and white items for winter. This is for someone who has been kind enough to make something for my Grandson Charlie for Christmas I will post what she has made onto Chizzy, Charlies Mum, as I will not be able to see him due to the circumstances that prevail. I will be making the Fingerless gloves next and sending them off to a friend as a Christmas gift along with a scarf I made that I will never make again. 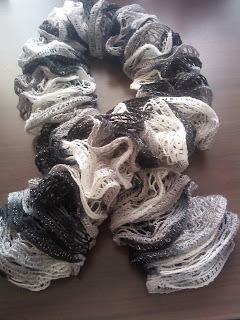 I had some of that awful ruffle stuff that was given to me and I made the scarf using the pattern on the band. Never again I really do not like using it so it is a one off, I have one that was made for me by a friend and in similar colours. I like my scarf and thought I have a go at making one, so when I was sent the ruffle yarn stuff I had a go. It turned out okay but I don't like using it for me it is fiddly and I don't do fiddly stuff. So my friend will have the one and only ruffle scarf to be made my me. 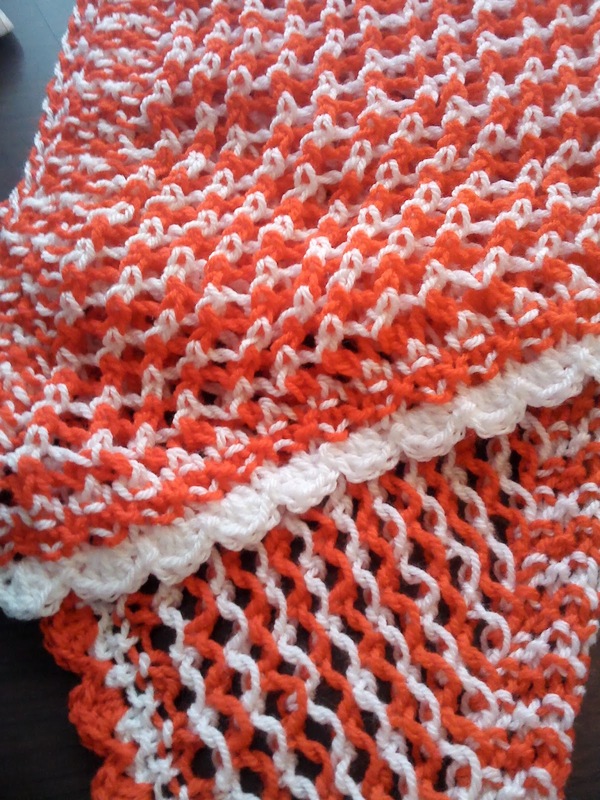 Here it is the One and Only Ruffle Scarf so my friend will have something unique, I hope she will like it as I have no idea if this is the sort of thing she would wear. So more Stash Busting is on its way and I have a lot to do so I will have to get those needles clicking and drive my poor husband Colin insane as I sit and knit whilst watching TV in the evenings.